The iPhone 4 gets an Australian release date on July 30th, with free bumper cases to address criticism of the phone’s signal dropout issues. Optus today defended the performance of its 3G mobile network and said it was working to improve customers’ experience on it. The telco has come under fire over the past year over drop-outs, slow data access and at-times patchy coverage on the network. Some customers have even setup the #badoptus hashtag on Twitter to document the questions. AMAZON.COM said it reached a milestone, selling more e-books than hardbacks over the past three months. Over the past month, the Seattle retailer sold 180 Kindle books for every 100 hardcover books it sold, it said. APPLE’S iPad has had such a big impact that companies are lowering their guard to allow employees to use it at work, a security expert says. Enterprises often lock down employee desktops, barring them from running executable files for fear rogue code could penetrate corporate networks. But with the iPad those safeguards have been thrown out the window, according to Unisys location, perimeter and surveillance security global head Neil Fisher. Some organisations have strict rules about allowing iPads to connect to the corporate WiFi network, but others don’t. The proposal, which one critic described as too traumatic and absurd, will come to fruition over the next year if Labor wins the August 21 election. Internet censorship expert Irene Graham said the overall issue with RC remained — both illegal and legal material would be trapped, a view the government had finally admitted to. Ms Graham said classification laws were complex and she questioned how the expert would fare when even the Classification Board and the Classification Review Board frequently disagreed. SOCIAL networking site Facebook has refused to take down a memorial page for British killer Raoul Moat. More than 35,000 people have joined a group called “RIP Raoul Moat You Legend”, leaving sympathy messages for the killer. Many of the messages are anti-police. Prime Minister David Cameron earlier expressed his bewilderment that Moat, 37, should attract any sympathy. He described him as a “callous murderer”. Moat shot and seriously wounded his ex-partner and killed her boyfriend. He then shot a traffic police officer, a 42-year-old father of two, in the face, blinding him. Facebook management rebuffed Downing Street, however, suggesting users who had posted supportive messages of the murderer were entitled to their views. Moat, who was known for his paranoia, fuelled by steroid abuse, recorded interviews and ringed his home in with CCTV cameras. Its reputation has already been tarnished by iPhone 4 antenna problems but now Apple faces a new PR nightmare as iPhone 3G owners say their handsets are barely usable after Apple pushed out a software update. The iOS 4.0 update was recently delivered automatically to iPhone 3G users when they connected the device to their computer. Many users have said their phones now regularly lock up and take an eternity to perform basic tasks like web browsing. Anthony Agius, founder of the popular Australian MacTalk community website, described the update as a “disaster” for iPhone 3G owners. “It’s just so slow, apps don’t run properly – to launch the SMS app for example might take 30 seconds, Safari chugs … the OS [operating system] itself will freeze,” he said, adding the problems persisted even with the recent minor iOS 4.0.1 update. The issues come after Apple was heavily criticised for failing to properly test the iPhone 4, which will be launched in Australia on July 30. Widespread antenna and reception issues were reported, and Apple largely dismissed the matter before its CEO, Steve Jobs, was forced to get on stage to respond late last week. He offered all iPhone 4 buyers free “bumper” cases that reportedly fixes the antenna problems by limiting contact between the phone and the hand. Darren Boehn, owner of Express Computer Repairs in Epping, said his iPhone 3G was unusable after it automatically updated to the latest software. “It keeps telling me to reinsert the SIM card, it drops out calls … one call last night that went for about 30 minutes dropped out seven times,” he said. There are several threads on the MacTalk forums where iPhone 3G owners are complaining about the update. “I’m so pissed off with Apple, my phone was perfect before the update and now I want to smash it,” wrote one user. Some users posited that Apple may have deliberately wrecked their phones so people would be forced to upgrade to the newer models, the iPhone 3GS or iPhone 4. While Apple does not permit people to downgrade to the previous version of iOS in iTunes, some sites have figured out a hack that allows people to revert to the older versions. Apple said it recommended iPhone 3G owners update to iOS 4.0.1. It said anyone with issues could contact Apple on 133 622 or access their local Apple retail store. It appears you won’t get mugged for your iPod in Sydney any more. A 15-year-old boy found out the good news at gun point in the city’s south yesterday. Police said the teen was walking along Strickland Crescent at Ashcroft when a youth with a black handgun and a purple streak in his hair approached him and demanded he hand over money. “[The boy] offered him an iPod but the attacker didn’t want that,” Green Valley Local Area Command duty officer, Inspector Siobhan Busetto, said. The youth ran away, leaving the boy unharmed and still in possession of his mp3 player. Inspector Busetto said the boy thought he might have seen his attacker before. “He thought it was someone who attended [his] high school a number of years ago … and that’s part of our investigation,” she said. The boy had short blond hair with a rat’s tail. He was described as white or European in appearance and was about 15 or 16. Anyone with information should contact Green Valley police via Crime Stoppers on 1800 333 000. Adobe is working on a new kind of creative software specifically intended to help you publish digital magazines for tablet devices such as the iPad, the company revealed today. This new software, which will soon take its place in the Creative Suite pantheon, will be downloadable from Adobe Labs and will include tools that bridge the gap between print-oriented InDesign and software for interactive formats. The company’s goal is to make it simpler for more publishers to create and profit from tablet magazines like Wired’s hugely successful iPad offering. Wired used InDesign and a mix of other software to make its product. The new Adobe technologies will focus on mobile hardware-specific needs, including 360-degree image rotation and pinch/swipe gestural navigation for panning and zooming. This is currently accomplished through an AIR utility, the Interactive Overlay Creator. In future versions of InDesign, the Interactive Overlay Creator will be an integrated feature. Adobe is also making it easier to add mobile-friendly multimedia to slick, print-reminiscent layouts. From what we can see in a brief demo, it looks like designers will have a lot of fun taking an on-screen mockup to a .issue format magazine with relative ease. We can’t wait to try it out ourselves. Adobe will let you import layouts from InDesign to the new workflow. From there, you’ll be able to add metadata, experiment with portrait and landscape layouts, and export content to the .issue format — a brand-new, ready-to-render file for digital magazines. When the new software becomes available for download, you’ll also get some handy documentation showing you how toimplement the digital content builder into your current workflow.And although the iPad is clearly the starting point for tablet magazine publishing, don’t think Adobe’s software will be limited to creating content for this device only; other tablets will also play nicely with Adobe-created digizines. Designers, what’s your opinion so far? Have any of you had the chance to play with this workflow yet? Facebook will finally reach the impressive 500 million user milestone sometime this coming week. To celebrate, it’ll launch “Facebook Stories,” a visual memorial to all the ways the social network has changed people’s lives. All Things Digital’s BoomTown blog uncovered the details in an interview with Facebook marketing guru Randi Zuckerberg last week. She said that while previous announcements of this nature have been about the numbers, this time the company wants it to be all about the users. That’d be empty PR-speak on its own, but she’s talking about a real initiative: Facebook Stories will be a website within Facebook that’ll sort actual, submitted user stories by location and theme. Theme examples given included “finding love” and “natural disasters.” Each story will be limited to the same number of characters a Facebook status caps out at: 420. Facebook has already posted a form through which you can submit your own story. If your story becomes popular — that is, if it gets more “Likes” than most — it could be featured among other popular stories. Facebook reached 400 million users five months ago. This time last year, it had just reached 200 million, and eight months before that it was at just 100 million. The site launched in February of 2004, and has since become the most popular social site on the web. If you use several Google accounts on a daily basis, you would probably like to be logged in to all of them at the same time. You have to use several different browsers to achieve that currently. Now, according to Google Operating System, Google is testing a feature that will let users log in to multiple Google accounts in the same web browser. Personally, I have at least four different Gmail accounts open at all times, and this feature is very high on my wish list. Google services that are currently being tested include Gmail, Reader, Sites, Calendar, Code and Docs. There is one limitation: if you turn on multiple sign-in, you cannot access Gmail in offline mode. Apple appears to be deliberately distorting the issues surrounding the iPhone 4’s antenna design by asserting that Research In Motion’s BlackBerry has similar reception problems, RIM said. Nokia and HTC have also taken issue with Apple chief executive Steve Jobs’s claims that their phones are afflicted by the antenna issues plaguing the iPhone 4. The device is set to launch in Australia on July 30. “Apple’s attempt to draw RIM into Apple’s self-made debacle is unacceptable,” RIM co-chief executives Mike Lazaridis and Jim Balsillie said in an emailed statement. Since the June 24 launch of the iPhone 4 in the US and Europe, some users have reported drastically reduced signal strength when they hold the touch-screen phone in a certain way, leading to dropped calls. In response to the complaints, Jobs said the entire smartphone industry shared such reception problems, naming specifically Research in Motion, Samsung Electronics and HTC. At a rare, 90-minute press conference, Jobs maintained there were no problems with the iPhone 4’s wraparound antenna design and accused the media of trying to “tear down” a company that had grown so successful. “This is life in the smartphone world. Phones aren’t perfect. Most every smartphone we tested behaved like this,” Jobs said. In response of his comments, RIM’s co-chief executives issued a statement defending the BlackBerry’s design and criticising Apple’s approach to dealing with the iPhone 4’s antenna issue. “RIM has avoided designs like the one Apple used in the iPhone 4 and instead has used innovative designs which reduce the risk for dropped calls, especially in areas of lower coverage,” they said. “One thing is for certain: RIM’s customers don’t need to use a case for their BlackBerry smartphone to maintain proper connectivity,” the statement said. RIM, based in Waterloo, Ontario, was referring to Jobs’s offer to provide iPhone 4 users with free phone cases to address the reception complaints. Nokia, in a statement to popular phone blog Boy Genius Report, said that it would always “prioritise antenna performance over physical design if they are ever in conflict”. “Nokia designs our phones to ensure acceptable performance in all real life cases, for example when the phone is held in either hand,” it said. Meanwhile, HTC told Pocket-lint.com that only 0.016 per cent of its customers had complained about antenna or signal problems. Apple, based in Cupertino, California, could not be reached immediately to comment. Google has pulled the plug on the Nexus One, its once highly anticipated smartphone, following disappointing sales. The last shipment has arrived at Google HQ, and once those are gone there will be no more Nexus One devices for U.S. consumers. The handset will still be sold through Vodafone in Europe and some Asian carriers, and developers will still be able to get their hands on one. However, it looks like the Droid phones on Verizon will carry the mantle for Google’s( ) Android( ) mobile operating system. This is the end of the company’s grand experiment with an unlocked consumer handset in the U.S.
Google closed the Nexus One web store two months ago; this final nail in the coffin was well overdue. Google announced the end of the line on its blog on Friday, but there was so little fanfare or interest in the story that the story slipped through the cracks. Although the Nexus One was popular with geeks, most American consumers probably just didn’t understand the concept of an unlocked handset, and Google didn’t put much marketing muscle behind the device. Thus, it’s no surprise that the phone has been discontinued and hardly anyone noticed. It’s too bad, actually. It was a fine device, improved further by the Android 2.2 update a couple of weeks ago. Online retail giant Amazon has said that sales of electronic books for the Kindle have overtaken hardcover book sales. Amazon founder and chief executive Jeff Bezos also said the growth rate of sales for the Kindle had tripled since the company cut the e-reader’s price from $US259 to $US189 a month ago. “We’ve reached a tipping point with the new price of Kindle,” Bezos said in a statement. “In addition, even while our hardcover sales continue to grow, the Kindle format has now overtaken the hardcover format,” he said. “Amazon.com customers now purchase more Kindle books than hardcover books – astonishing when you consider that we’ve been selling hardcover books for 15 years, and Kindle books for 33 months,” Bezos said. The figures do not include sales of paperbacks. The Seattle-based online store also said it had sold three times as many Kindle books in the first half of 2010 as in the first half of 2009. Amazon does not release sales figures for the Kindle but says it has been the company’s bestselling item for two years. Facing competition from Apple’s new iPad tablet computer, Amazon dropped the price of its basic Kindle on June 21 to $US189. On July 1, Amazon unveiled a new large-screen version of its Kindle and cut the price to $US379 dollars from $US489 dollars. Televisions will soon start to outnumber the number of people in the average Australian household as the cost of flat-screens declines and viewing habits change, experts say. Sales of televisions larger than 40 inches recorded 75 per cent growth in the past year, with 140,000 sold in the six weeks before the Socceroos’ opening round World Cup match against Germany on June 13, according to analysis by the industry research group, GfK. But due to an average fall of $700 in the cost of TVs since May last year, overall revenue for the category has increased by only a marginal amount. ”We’re trying to put more features in the products to hold them up in price,” Mark Leathan, head of marketing consumer electronics for Samsung, said. The launch of 3D in home entertainment has also exerted downward pressure on prices for regular TVs. A top-range television that sold for $3999 last year is available this year, with 3D capability for less than $3700, Mr Leathan said. Last year Australians bought 2.7 million televisions, with LCD units outselling plasmas by a ratio of 3.5 to one. Size also matters, with 46- to 50-inch televisions now considered the norm. Compared with the cathode-ray televisions, which were kept for an average of 10 years, flat-screen TVs were being updated about every five years, he said. The rapid changeover has contributed to Australians owning an average 2.4 televisions, and that figure is expected to rise to 3.1. In contrast, the average household will shrink to just 2.4 people by next year, according to the Bureau of Statistics. Increased television ownership is associated with a higher risk of being overweight or obese, Professor David Crawford, director of the Centre for Physical Activity and Nutrition at Deakin University, said. ”Even for people who are quite physically active, the amount of television they watch increases their risk of unhealthy weight gain,” he said. Facebook’s co-founders Mark Zuckerberg and Dustin Moscovitz have both expressed some measure of disapproval where the highly anticipated film The Social Network is concerned. Moscovitz published a frank assessment of the upcoming movie on a Q&A site, saying the trailers seemed “a lot more exciting” than the actual goings-on during Facebook’s earlier days. Zuckerberg, currently Facebook’s CEO, had some negative comments about the film when he took the stage at the D conference last month, saying he wished the movie had not been made. Moscovitz wasn’t completely down on the movie; however, his mostly sarcastic comments did belabor the point that the film is anything but historically accurate — at least from his perspective. “It is interesting to see my past rewritten in a way that emphasises things that didn’t matter,” he wrote — “things that didn’t matter” referring to a breach of contract/IP theft lawsuit brought by fellow Harvard students Tyler and Cameron Winklevoss in 2004. Facebook’s big movie role: the poster for the film by Columbia Pictures. When it comes to the film’s portrayal of Zuckerberg, Moscovitz is at once cautiously pessimistic and fawning. Moscovitz currently heads up Asana, a Silicon Valley startup who counts a few Facebook and Google heavy-hitters among its staff. When not drinking and carousing with coeds, they build project management software. Mashable.com is the world’s largest blog focused exclusively on social media news. If video killed the radio star, then downloads may in turn kill the video. The advent of Foxtel IQ, Telstra’s T-box and fetchTV, which allow movies to be downloaded on demand, threatens to render the local video store redundant. The writing has been on the wall for some time now. Only in the last few weeks, Blockbuster stores at Ashfield, Bondi Junction and Enmore have closed their doors, as well as a Video Ezy outlet in Paddington. A recent PricewaterhouseCoopers outlook predicted digital downloads would grow by a massive 176 per cent in the next few years. An IBISWorld forecast for the top- and bottom-five industries this financial year put video stores at No. 4 among the potential losers. It won’t happen overnight but it appears that the familiar ritual of popping into the video shop, trawling the aisles and exchanging obscure film facts with the guy behind the counter may one day be a thing of the past. The technology, entertainment and media industry leader at PWC, David Wiadrowski, said a key factor would be the roll-out of the national broadband network, meaning faster downloads. But he added that other competing forces were already in play, including Oovie, the DVD-rental vending machines, and companies such as Quickflix, an online rental and movie-subscription company. ”I don’t think it’s really the end of the video stores … but they will need to innovate,” Mr Wiadrowski said. They may need to diversify or offer a broader range of products. But the video stores do not plan to go quietly. Some are already fighting back, ironically using technology to beat technology by putting their catalogues online. Video Ezy at Edgecliff has its entire 14,000-item stock list on its website. Customers can browse online while at work, reserve a title and then pop into the shop – beside the railway station – on their way home. The store’s senior manager, John Menlove, said the change had allowed the business to move to smaller – and less expensive – premises because every title did not have to be on display for store browsers. Yet it retained the personal touch; many customers still wanted to talk to a human and have films recommended to them, he said. Mr Menlove conceded the shop had lost business because of digital downloads, but that was just one competitor, he said. The advent of Foxtel hit him hard as so many of his eastern suburbs clientele had quickly subscribed to the pay TV service. An even bigger threat was piracy, with illegally copied DVDs selling for just a couple of dollars at dodgy stores in the city, he said. But Dr What had a niche market and regular customers, which would help sustain it, he said. A survey of video stores commissioned by the Australian Video Rental Retailers Association last year painted quite a rosy picture, noting that stores had recorded continual steady profits in the previous five years and predicting income would grow by 9.5 per cent in 2009. IT can be a traveller’s great fear – sitting near a screaming child on a passenger plane. American tourist Jean Barnard, who embarked on her dream holiday to Australia and New Zealand in January last year, alleges the trip became a nightmare when she boarded a Darwin-bound Qantas plane in Alice Springs. She said she walked to her assigned seat and came face-to-face with a three-year-old boy across the aisle. The boy allegedly leant back over his armrest toward Ms Barnard and let out a scream so severe that blood erupted from her ears, leaving her “stone cold deaf”. No other passengers were injured. Ms Barnard was helped off the plane and taken to an Alice Springs hospital, ruining her trip that began in Brisbane and Cairns, and after Alice Springs and a visit to Uluru, was scheduled to take her to Darwin, Adelaide, Melbourne, Hobart, Sydney, Christchurch and Queenstown. “The pain was so excruciating that I didn’t even know I was deaf,” Ms Barnard said, reliving the incident during a deposition for a civil lawsuit she filed against Qantas in the US District Court in Los Angeles. Ms Barnard has been locked in a legal tussle with Qantas for more than a year, with the 67-year-old claiming she suffered severe and permanent injuries, including sudden sensio-neural hearing loss, from the child’s scream. She has sought damages for physical and mental suffering, medical expenses and loss of impairment of earning capacity. Her lawyer, Brian Lawler, argued Qantas was negligent because the plane’s cabin and cockpit crew failed “to take all the necessary precautions to prevent the accident that resulted” in her “injury”. Qantas’s US legal team vigorously fought the case, claiming there was evidence Ms Barnard had a hearing problem before she left the US for Australia. Qantas referred to emails allegedly written by Ms Barnard to a travel companion prior to the Australian trip in which she admitted wearing hearing aids, and submitted a volatile email Ms Barnard allegedly wrote a day after the incident to the US travel agent who booked the trip. “I guess we are simply fortunate that my eardrum was exploding and I was swallowing blood. Had it not been for that, I would have dragged that kid out of his mother’s arms and stomped him to death. Then we would have an ‘international incident’,” Ms Barnard allegedly wrote. The warring parties, however, announced last week to the judge handling the case that a truce had been reached and they “entered into a confidential settlement”. Qantas declined to say if the settlement included payment to Ms Barnard. “There is a confidential settlement and we can’t make any comment,” Qantas’s senior executive vice president for The Americas, Wally Mariani, said. n an email, Ms Barnard wrote: “I have signed a confidential release and settlement agreement with Qantas Airlines for the lawsuit about my having been rendered deaf on a Qantas airliner on January 16, 2009. As per the release, I can/will no longer communicate with you regarding this incident”. In correspondence before signing the agreement, Ms Barnard, a co-owner and senior partner of an international business consulting firm, wrote that “my life came to an end January 16, 2009”. “I have not been able to work since the ‘incident’. Since I cannot carry my load, we have put the business on the market and are, for all practical purposes, out of business,” she wrote in an email in May. Apple is offering a free case to every owner of its iPhone 4. Apple boss Steve Jobs unveiled the offer at a press conference called to tackle the ongoing speculation about the iPhone 4’s antenna problem. The case will help overcome a widely reported issue in which phone signal strength was drained when the phone was held a certain way. Declaring “We’re not perfect”, Mr Jobs said reception problems were endemic throughout the smartphone industry. To get their free case, owners will be able to apply via the Apple website from 22 July. Mr Jobs said Apple could not make enough for all owners of the phone but would source a supply and offer a range of cases. Based on retail prices of iPhone cases, supplying one to all three million customers could cost Apple about $180m (£118m). Apple will offer the free cases until 30 September. Mr Jobs also extended an offer to iPhone 4 users to give them a full refund within 30 days if they were still unhappy with the handset’s performance. “They had to do something,” Van Baker, research vice president at Gartner, told BBC News. Brian Marshall, managing director of Gleacher & Company, said he did not think the negative headlines hurt Apple in the marketplace though he was pleased to see it take action. “This has been blown out of proportion and is a media firestorm,” he said. Apple called the press conference at which the case offer was made in response to ongoing speculation about the antenna issue. The problem is thought to be caused by the steel case of the phone which houses several of the phone’s antennas. Holding the phone on the lower left bridges the gap between two antenna depleting the signal. Putting a case or “bumpers” around the phone stops this gap being bridged. 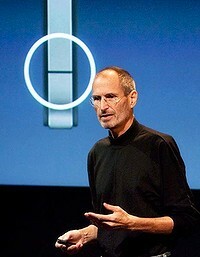 Opening the conference, Mr Jobs said that the drop in signal strength was not a problem “unique” to the iPhone 4. “This has been blown so out of proportion, it’s incredible,” he said. Apple had been looking closely at the issue since the first reports of problems surfaced just over three weeks ago, he said. Videos comparing the iPhone 4 signal drop to other smartphones, such as the Blackberry Bold 9700, were aired by Mr Jobs during the conference. He said this was a reflection of life in the smartphone world and presented a challenge for the whole industry. Mr Jobs said the design of the iPhone 4, with a gap separating two sections of antenna, might have contributed to the problems as it perhaps subliminally encouraged people to touch that spot. In the firm’s defence, he cited figures from its Apple Care service arm which showed that only 0.55% of all iPhone 4 users have complained to the company about the issue. The number of phones returned to Apple was 1.7%, less than the 6% of 3GS models taken back to the shop by their owners. Mr Jobs also shared data about the number of calls the iPhone4 dropped compared to the 3GS. This revealed that the iPhone 4 drops only one call more per hundred than its predecessor. He speculated that this was because most people who own a 3GS have a case for it. By contrast, he said, most iPhone4s leave Apple stores without a case. Technology reporter Maggie Shiels who attended the conference for the BBC said it was a “sterling” performance by Mr Jobs. “While he constantly underscored how hard Apple had worked to resolve the problem, he came out swinging for the fences and defended the phone to the hilt,” she said. Traditional flu jabs may be rendered obsolete by a hi-tech skin patch which delivers vaccine painlessly through scores of tiny needles. The patch could revolutionise pandemic control by allowing vaccines to be self-administered, scientists in the US say. The patch can be easily used at home by someone with no medical training. When the patch is applied to the skin, its hundred ‘microneedles’ – each measuring just over half a millimetre – deliver the vaccine and simply dissolve away. The needle arrays are made from a plastic-like polymer that is known to be safe for use in the body. What remains is a water-soluble backing that can safely be discarded. Tests on mice showed that vaccination with the microneedles caused a stronger immune response than an injection by syringe. The patch could aid mass-immunisation in poor parts of the world. It could help to avoid infections such as HIV and hepatitis B that are often spread by re-use of dirty hypodermic needles. ‘We envision people getting the patch in the mail or at a pharmacy and then self-administering it at home,’ said Dr Sean Sullivan, another member of the Georgia team. Other vaccines could be applied with the same technique, the scientists believe. The cost of mass-produced patches are estimated to be about the same as conventional jabs. But the reduced need for personnel may bring the overall cost of immunisation programmes down. The patch will still have to undergo patient trials to assure its safety and effectiveness before being made generally available. Nokia Siemens says it has bought most of the Motorola networks. The company says the deal is ‘expected to significantly strengthen Nokia Siemens Networks’ presence globally, particularly in the United States and Japan’. The deal was expected to be completed by the end of 2010. Nokia Siemens Networks, a joint venture between Finland’s Nokia Corp and Siemens AG of Germany, said the deal would improve its profitability and ‘have significant upside potential’. More than half of Australian parents with children using online social networking services like Facebook and Twitter say the services are distracting them from their studies according to the latest Cyber-safety Research Report commissioned by Telstra. The survey of parents with children aged 10 to 17 years was conducted by Newspoll and shows the problem is more pronounced with teenagers aged between 14 and 17 years. It also shows 65 per cent of parents report social networking is frequently or occasionally distracting their children from their homework. The Telstra Cyber-safety Research Report has led cyber-safety expert Dr Martyn Wild, Managing Director of SuperClubsPLUS Australia, to encourage parents to place computers in family areas such as a lounge room, in an effort to keep younger school children focused on their studies. ‘You wouldn’t let your kids stay out socialising with their friends until all hours on a school night, but that is exactly what they are doing online, often right under their parents’ noses,’ Dr Wild said. ‘The answer is not turning off internet access, rather it’s about implementing simple behavioural changes in your children and setting realistic expectations about their use of the internet. ‘But with older students, parents and carers will need to develop the trust for these students to exercise their own judgements about balancing online ‘play’ and ‘work’ sensibly and responsibly. ‘As sites like Facebook continue to grow in popularity, parents should set ‘house rules’ and help their children learn responsible online behaviours just as they do in regards to their non-internet lives. I don’t suggest you become an ‘internet big brother’, just be aware of when and what your kids are doing online and be prepared to set realistic guidelines,’ Dr Wild said. For more information, visit www.telstra.com.au/cyber-safety.